Ridge gourd is slightly peeled and chopped into long cylinders. Moong dal is soaked and ground into paste along with spices. The mixture is then stuffed in ridge gourd and cooked till done. Serve moong stuffed ridge gourd with steamed rice and dollop of ghee. Makes: around 20 Moong Stuffed Ridge Gourd. Slightly peel, wash and chop ridge gourd into around 2 inch long cylinders (around 20 cylinders). Soak moong dal in water for around an hour. Strain the soaked moong dal. Grind red chiles, garlic and salt into powder. Add the soaked moong dal and grind everything into coarse paste. When mustard seeds start spluttering, carefully place the stuffed ridge gourd in the pan. Cook covered on low flame for around 5 minutes or until ridge gourd turns little soft. Turn the stuffed ridge gourd to make sure all the sides turn golden brown. Once moong dal is cooked and ridge gourd is golden brown, remove from heat. 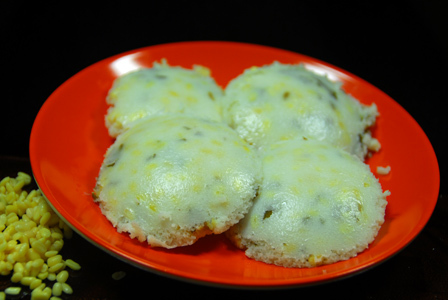 Serve moong stuffed ridge gourd with steamed rice and dollop of ghee. Suggestions: Adjust spice with red chiles. Make sure to soak the moong dal well. Variations: Check other stuffed ridge gourd recipes here. Other Names: Moong Stuffed Ridge Gourd, Beerakaya Pesarapappu. Snake gourd is chopped into circles and boiled in water till soft. 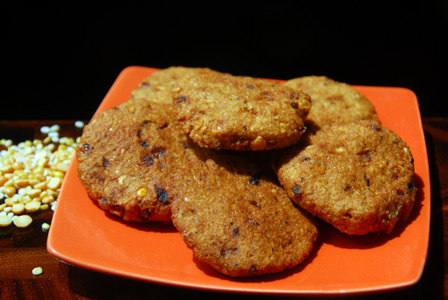 Moong dal is boiled separately till soft but whole and added to the cooked snake gourd. 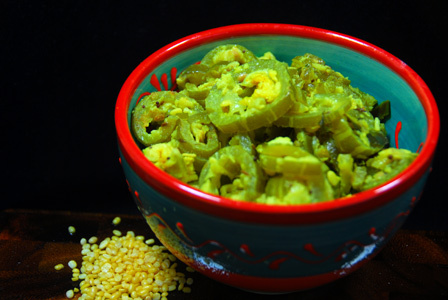 Serve snake gourd with moong dal over steamed rice and dollop of ghee. Makes: around 3 Servings of Snake Gourd Moong Curry. Discard the seeds and chop the snake gourd into small circles. Once moong dal is translucent but whole and soft, strain it. Fry for few seconds, add cooked snake gourd and fry for couple of minutes. 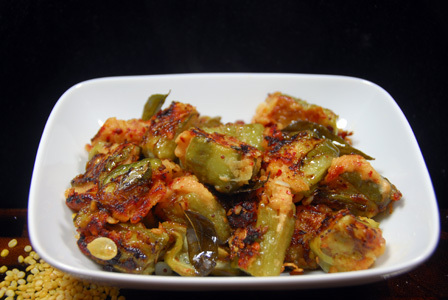 Alternatively, if snake gourd is tender, cook covered in the pan till soft instead of boiling it. Stir in cooked moong dal, turmeric powder and salt. Fry for few minutes and remove from heat. Serve snake gourd moong dal curry over plain steamed rice and dollop of ghee. Suggestions: Adjust spice with green chiles. If snake gourd is not cooked well, put the curry back on heat and cook covered on low flame till done. Add a splash of water if required. Variations: Check other recipes with snake gourd here. Other Names: Snake Gourd Moong Curry, Potlakaya Pesarapappu Kura. Makes: around 4 Servings of Whole Moong Masala. Wash whole moong under water and pressure cook in 1 cup of water for 3 whistles. Let the pressure release completely before opening the lid. Stir in amchur powder, coriander powder, chole masala powder, garam masala powder, sugar, turmeric powder, red chili powder and salt. Fry for around half a minute, stir in tomato puree. Bring the tomato puree to a bubble, stir in cooked whole moong along with the water it is cooked in. Boil the mixture till oil separates from the sides of the pot. Adjust any seasonings if necessary and garnish with chopped cilantro. Notes: Make sure to cook the whole moong well. 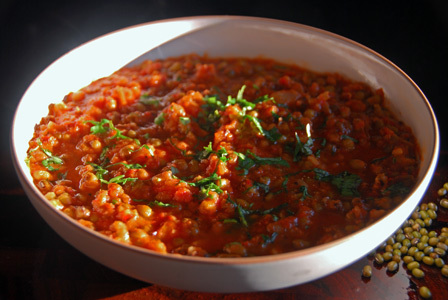 Suggestions: If the whole moong is not cooked completely, let it boil in the tomato mixture till cooked. Add water if necessary during the cooking process. If the whole moong is overcooked in pressure cooker, make sure to not overboil in once added to the tomato gravy. Variations: Check other whole moong recipes like vada, deep fried moong, and rasam etc..
Other Names: Whole Moong Masala, Pesala Masala.